Effect of charge composition on the mechanical properties and crack formation in steel castings for various applications was investigated. Key words: charge, castings, mechanical properties, cracks, intercrystalline corrosion. 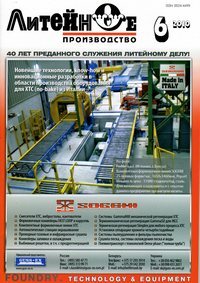 Optimal composition of deoxidizers in making grade 30ХМЛ steel for the purpose of eliminating top surface blisters in critical valve castings has been determined. Key words: killing, inoculation, cold resistance, nonmetallic inclusions, top surface blisters. Moiseyev V.S., Smykov A.F., Bobryshev B.L., Varfolomeyev M.S., Moiseyev K.V. New Developments by the Foundry Chair of K.E. Tsiolkovsky RGTU - "MATI"
The article reports about work by the Chair "Computer-aided design and foundry technology" of MATI as applied to the production of critical castings, such as blades for gas turbines and thin-walled large-size missile bodies. Key words: gating system, blade, body, chill mold, chill, core, gassing capacity crumblability, moisture. Completed casting aluminum lined with uncooled form centered on the uncooled and cooled heat pipe. Established that the cooling time of hollow casting is reduced by more than 3 times in the presence of cooling pipes. Thus, increasing more than twice the rate of crystallization of the metal. Key words: lined form, heat pipe, aluminum, cooling, water. A review of modern methods of rapid prototyping, and procedures that allow implementing those technologies in creating patterns and foundry molds is presented. Key words: prototype, rapid instrumentation, polymer, shell mold, spray metal casting, vulcanization casting, gypsum mold. Studied technological properties of Z-cast molding sand designed for mold and casting manufacture by the method of 3D printing, as well as results of sand X-ray phase analysis are presented. Dependence of strength characteristics of Z-cast sand on the impregnation material and heat treatment modes has been revealed. Effect of various inoculants on the strength and technological properties of sand have been established, and experimental compounds virtually not inferior to the proprietary material Z-cast by its technological properties have been obtained. Key words: 3D printing, Z-cast sand, 3D printer, foundry mold, technological properties of sand, inoculant, import-replacing counterpart, InkJet. Effect of storage conditions and duration on the technological properties of molds made by the method of 3D printing is discussed. Dependencies of gas permeability values of sand on the time of contact with hot metal have been obtained. Analysis of the data obtained shows a discrepancy between the values of technological properties of sands conventionally made under normal conditions and the actual values during metal pouring and casting cooling. Key words: 3D printing, cold-hardening sands, gas permeability, thermal destruction of binder.